Virgin Atlantic Rating: 6 out of 10 Reviewed by Airreview from 69 flights with 123 photos. NEWS: Virgin Atlantic is buying the new Boeing 787. It has 15 787-900s on order. With this new aircraft it plans to open new routes. There are also 6 A380, and 10 A330s on order. Virgin Atlantic has three classes of service: Economy, Premium Economy and Upper Class, although exactly which style you get vary with the age of the plane. At all seats in all cabins you will get a seatback TV on Virgin Atlantic: Virgin Atlantic's inflight entertainment and seatback TV. Virgin Atlantic calls its business-class product offering Upper Class. The seat is in a Herringbone design, so you fly facing 45 degrees to the direction of travel, and this design means you can pass the flight without having to see or talk to your neighbour. The suite is however a problem with couples travelling together - it is really quite hard to chat. 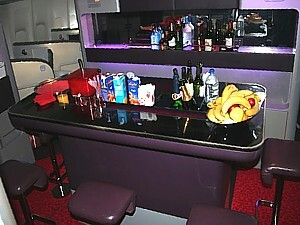 The Upper Class Suite is fitted on all Virgin's A340-600 and 747-400 aircraft. The seat offers in-seat laptop power and power leads for iPods. The seat was brand new in 2003, which at the time was the longest totally flat bed in Business Class, and was so novel it was licensed by Air New Zealand and Cathay Pacific, but it is now looking a little dated. A refresh of the cabin has helped, but it’s now not the groundbreaking experience it once was. 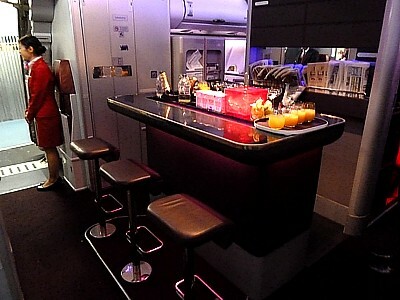 Virgin Upper class has one great advantage over most other airlines - an in-flight bar, with four wobbly bar stools grouped around a small curved bar (three on the Airbus). If you hate booze, ask for a seat away from the Virgin bar, as it can get a bit rowdy. If you like to wander round in the cabin during the flight, grab one of the stools next to the bar, and pick up a newspaper (the only place they will be) and then wobble away on the small and rather flimsy bar stool as the plane goes through turbulence. This is really a very good perk, but the inflight bar is better on Emirates where there is a large curved bar and live sports on the big screen. On board in Upper Class there are the unique Virgin massage services, as well as the improved meals and drink service. Virgin Upper Class passengers can request complimentary limousine pick-up and drop-off at the airport, and at their destination, although the limousine is not available to those who purchase the cheaper "Z" coded Upper Class fares. At the airport, Upper Class passengers can use Virgin's clubhouse lounge. 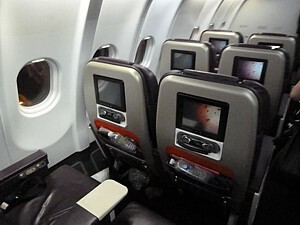 Premium Economy is really all about a larger seat with more leg room than Economy, and a few trivial perks on the side. 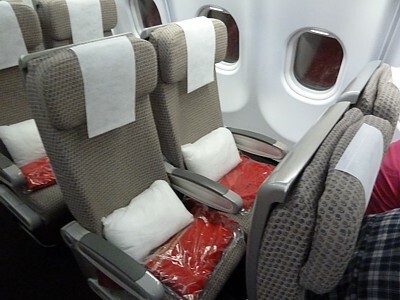 Virgin Atlantic Premium Economy is all about the seat with extra leg room – all of 38 inches. A new Premium Economy seat was introduced by Virgin in 2006, being just a bit wider and with a plug that supplies laptop power. and It almost feels like a business class seat as there were in the early 80s - if you remember that far back. PE on a 747 is well worth it as it is a 2-2 configuration on the Upper Deck so it feels roomy and is quiet. 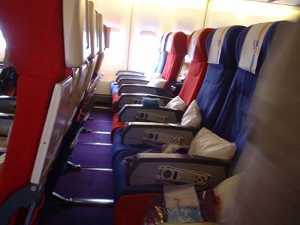 On a A340-300 or A340-600, the seats are in a 2-3-2 configuration. There are some other perks, but they are really frills on the side. There is a separate check-in, and a welcome glass of Sparkling Wine. There is no special service in PE other than for a welcome glass of bubbly prior to take off (and that’s the only free bubbly you are entitled to in PE), sometimes a pre-dinner drink (on long flights) and an after dinner brandy or Baileys. Food is the same as in economy, but you get it on chinaware with a tablecloth and with real metal knives and forks. You do get fed first, before the rest of the cabin so the crew are unlikely to have run out of the meal options you can ask for. The content of the amenities kit is the same as in economy, but you get it in a felt wallet. And that’s about it – other than the extra Flying Club miles, which aren’t to be sneezed at. 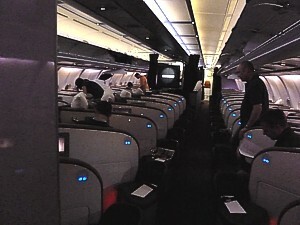 When it was launched, Virgin Atlantic Premium Economy was revolutionary, but it has since been outclassed by British Airways (with Business Class meals) Qantas (with Business Class wine ), Air New Zealand (with an amazing seat) and even Virgin Australia itself (with a walk-up snack bar). In Economy prepare for a bit of a shock when you sit in the seats. 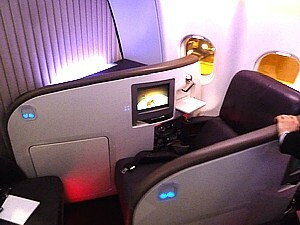 Virgin Atlantic's seat pitch varies between a "stunning" 30 inches, and 31 inches on the latest airbus planes. That’s more than Virgin legally needs to provide, but it’s still fairly cramp. If you are tall you can however buy the exit row seats at £50 at checkin, or for US$110 in America. However updated economy seats with an adjustable lumbar support are being installed across Virgin Atlantic's fleet and these do feel just a bit more comfortable. In economy you get a seat, free seatback entertainment, an amenity kit, one free hot meal and one cold, and a limited supply of free alcoholic drinks (in effect just one with your meal, unless you take a trip to the galley). Virgin Atlantic flies a combination of 747s, Airbus A340s and the twin-engined Airbus A330. Within a few years the airline will add some of the new Airbus A380 double decked planes to transatlantic routes. 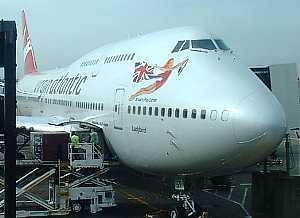 Virgin Atlantic have 12 Boeing 747-400 in the fleet. There are three different versions of Boeing's 747 flying with Virgin Atlantic - and the version you get can seriously impact your comfort, although not as much as it once did, when there five variants. They alter from absolutely great, with the latest upper class suite, to woeful in economy with tiny seatback TVs. The standard LHR 747 product with Upper Class Suites has a split upper deck, giving both 5 rows of upper class (aligned on a slant), and 5 rows of 2+2 premium economy seats, which are highly prized by regular passengers, particularly the exit row 70. Downstairs Upper Class occupies the front, with seven rows of seats, in a 1+1 layout. Row 6 is right in the nose, and is very popular due to it's privacy. After the galley there are six more rows of the Suite, in a 1+2+1 layout. The famous bar is at row 20 facing forwards. Avoid row 20 on dayflights if you want to sleep - a lot of people will be by the bar. 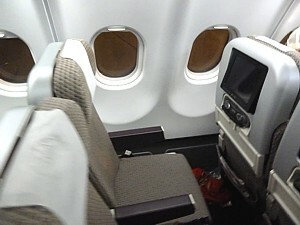 There are three rows of Premium Economy, in 75 to 77, where 75 is the exit, and are very popular. Out the back there are three banks of economy seats, in 3+4+3. Rows 38 and 49 are exit rows, although lookout of of the window can be difficult here. More popular is row 30, which is a bulkhead, but it has a good window. For the 747 from LHR with old style seating the split upper deck has both 3 rows of upper class in 2+2, and 5 rows of premium economy seats. Downstairs Upper Class occupies the front, with four rows of seats, in a 2+2 layout. Row 6 is right in the nose, and is very popular due to it's privacy. After the galley there are two rows, 11 and 12 in a 2+2+2 layout, then rows 14 & 15 with 2+2, and the bar in between facing sideways. Premium Economy and economy are the same as with the newer 747s. The Gatwick 747s with the Upper Class Suite just have Upper Class in the nose. Here there are 7 rows of upper class (aligned on a slant) in rows 6 to 12. There is a much smaller bar than in the LHR versions - with just 2 seats - by row 11. Premium Economy is in the upstairs bubble, with 2 banks or 5 rows of seats in a 2+2 layout, from row 70 to 80. 75 is the exit row, with more legroom. Downstairs is a highly unpopular strip of 2 Premium seats in row 81 and 82, in 2+4+2, behind which are three rows (2 on the left) of economy, in 21 to 23, in 3+4+3. There then come banks of economy seats in 3+4+3. Exit rows are at row 25, 38 and 49. All Gatwick 747s now have the suite. The older 747-200s have been scrapped: they served their retirement out of Manchester well, and just had Upper Class in the much smaller bubble in just rows 2, 3 & 4, and in nose in row 6 to 9. There are 4 Airbus A340-300, and 15 of the larger Airbus A340-600 (with another 11 on order), which are used on the longest of long haul flights. There are also 10 of the twin engine A330-300. There are two versions of the A340, and these are again split into two sub-types. There is seatback TV on All Virgin Atlantic A340 with Inflight Entertainment using the VERA system, which has full AVOD (you can start and stop video as you like), but there aren’t that many films, or come to that TV programmes: expect about 20 films (of which about 10 are in the UK box office) and a similar number of TV series. The system is starting to look quite old. The A340-600 has a long rack of 17 rows of Upper Class Suites, in 1+1+1 with the bar facing backward by row 17. 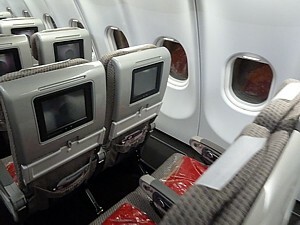 The middle row of seats is split, with half facing one way, and half the other: there is a ‘cabin divider’ at the split, in front of row 8 – if this has a strange cloth circle with a cross, you are on a revamped plane. After the galley there are four rows of Premium Economy in 2+3+2, with row 18 having a lot more legroom (and two windows). In the front row of Virgin Atlantic Premium Economy there is an unusual footrest: after takeoff the crew come around and deliver ottomans for you to rest your ankles on! The last row – Row 23 of Premium Economy on the A340-600 is the pits: you are directly opposite the toilets and blinded by the light each time it opens in the night. Avoid. The Virgin Atlantic A340 Economy seating plan is a basic 2-4-2 layout. Emergency exit rows are at row 31 and 51. There are four middle rows - 43 to 46 - which are highly prized as they are very quiet - almost like having a private cabin - however reviews of this mini cabin are mixed, with some passengers preferring its exclusivity, however other people have the opinion that it can be noisier as it has the economy class bassinette seats right behind it (the screamer or cot seats, where young children are put on the flip down shelf and often scream thought the flight). 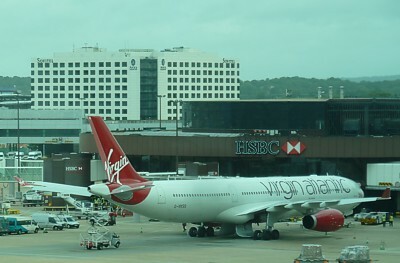 Virgin Atlantic became the first airline to fly the A340-600 in August 2002, and at the time it was the longest plane in the air. It still has a certain grace as it comes into Heathrow. 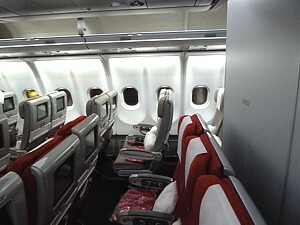 For the A340-300 with Upper Class Suites in the nose of the plane there are 9 rows of suites, in 1+1+1. The bar faces forwards by row 9. After the galley there are three more rows of suites, rows 14 to 16. There are five rows of Premium Economy in 2+3+2, in 18 to 22 (these are over the wing, restricting the view) and then two banks of economy, in a 2+4+2 layout. There is an emergency exit at row 50. Without the suites, Upper Class is in a 2+2+2 layout, in rows 1 to 5, with the bar facing left by row 5, and then 2 more rows of upper class after the galley. There are just 4 rows of premium economy, and then 2 banks of economy. The Virgin Atlantic A330 is quite similar to the A330, but much newer – this aircraft is a radical departure for Virgin, which previously had boasted about always having four engines for long haul. On the A330 there are only two, but the fuel saving is worth it, which is why Virgin Atlantic has recently bought this aeroplane. They fly to lower-level Virgin Atlantic destinations on the US East Coast, East and West Africa, Dubai, and India. Al the A330s have the Vera system of Virgin Atlantic entertainment. It has full AVOD (you can start and stop video as you like), and many more films than the A340 version: about 20 will be UK box office currents. There are again two types of A330 flying. On the type with Upper Class, this occupies rows 1 to 9, but beware – unlike its A340 sister, there are two rows of Upper Class seats in the middle. As a result the cabin feels more cramp, and service is noticeably slower. There is much more Premium Economy on the Virgin Atlantic A330 –with no less than seven rows of Premium Economy in 2-3-2 seating layout, with row 18 having a lot more legroom (and two windows). In the front row of Virgin Atlantic Premium Economy there is an unusual footrest: after takeoff the crew come around and deliver ottomans for you to rest your ankles on! The last row – Row 25 of Premium Economy – is quiet: there are no toilets nearby, nor bassinettes behind. Economy has a 2-4-2 layout, and is split into two cabins, with row 40 to 45 being much quieter than the large rear cabin. There is one final Virgin Atlantic A330 seating plan, without Upper Class: this is used for bucket-and-spade routes out of low-cost origins in the UK. This has eight rows of Premium Economy in the nose, and then two large cabins of economy. Row 30 and row 50 are emergency exit seats. From the way passengers in Premium carry on, you'd think they thought they were in Business Class - which some of them do. Virgin Atlantic has ordered 6 Airbus A380 aircraft with options on 6 more. The first delivery is expected to enter service late in 2014 or 2015 and the aircraft will be used on services from London to Hong Kong, Los Angeles, New York, San Francisco, Sydney and Tokyo. Virgin Atlantic use the single aisle Airbus A320 for the domestic runs up north on Little Red. There are four in the fleet, which are operated by Aer Lingus. They take the place of the former feeder flights which were operated by bmi, before BA took it over. The only flights are from London to Aberdeen, Edinburgh and Manchester. 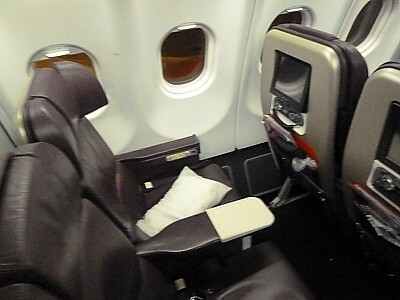 Virgin Atlantic A320s seat 140, in economy with a 3-3 layout. Row 17 and Row 18 are the overwing emergency exit - if you ask to sit here, you will get 2 inches more legroom. Row 18 is highly prized, as the seat here reclines fully. Pitch is 33" and width is 17". All models have large 14 inch fold down LCD TV screen under the overhead lockers for both classes. They are never used for entertainment. It would be a bit pointless, as the flight up to Manchester only takes about 40 minutes.